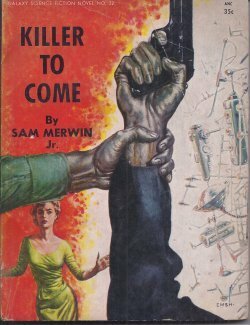 Killer To Come by Sam Merwin Jr.
Due to his research into the lives of geniuses, Dr Julius Conrad of the Wellington Institute for the Study of the Humanities has developed a radical hypothesis: Namely, that the work of most geniuses, past and present, has been directed by minds from a ruthless future which take possession of either the unstable geniuses themselves or else of unstable people who are in a position to change the course of the geniuses' work. When their transatlantic airship is destroyed, three survivors find themselves in a lost world 25,000 years in the past, a world peopled by Neanderthals and Cro-Magnons. Claire Stranlay must somehow survive and does so in the only way she knows how. This is the story of an expedition, a strange and exciting expedition of one man and an army of women. He had come into the land of the women suddenly and without warning. Tall, bronzed, muscular, he stood out among their pale skins and meek spirits.